It takes someone really whip-cracking smart to be so dumb. I remember the first time I lived in the Blue Ridge Mountains of North Carolina, and spring morphed into summer and there was the kind of glory only a Dante could describe, and a friend of mine came to visit to see the spring wildflowers. He was one of the smartest people I’ve ever known. The wildflowers in Ashe County are lush, blinding, thick — the planet in rut. But he went from patch to patch in an abandoned apple orchard with a Peterson’s guide in hand, checking the flowers off as he named them – Claytonia virginiana, Rhododendron nudiflorum, Trillium erectum. The quicker he identified them, the quicker he could get on to the next specimen. We ID’d more than a hundred flowers in one morning, but didn’t see any of them. I notice the same phenomenon every time I visit an art museum. People walk from picture to picture, identify what the picture is and move on to the next one. First-timers name the pictures by subject – ”That’s a horse, that’s a tree.” More sophisticated types name the artists – ”That’s a Degas, that’s a Borofsky.” The really educated may name the style or era. But whatever level of education they bring to the work, the result is the same. They have not seen the art. I remember the anecdote about the Swiss-American scientist Louis Agassiz and his hotshot graduate student. So the student came back with the scientific name for a sunfish. The scientist told him, no, describe it. So the student wrote a four-page essay, covering everything that could possibly be known about the fish. Agassiz told him again to look at the fish. As Ezra Pound relates the story, at the end of three weeks, the fish was putrid, but the student finally knew something about it. Learning to see is hard work. We are not trained to see in this culture, but to make decisions and solve problems. When just enough information has been gained to make a good — yet quick — decision, we move on to the next problem, like the next painting. It is the mark of a good executive. But seeing is much more than that. And it requires more time and effort. And it requires that the result of the process never be made more important than the process itself. Imagine telling a corporate VP that the point of being in business is not making a profit, but the pleasure of committee meetings and phone calls. He will look at you like you’re an idiot. But this is art, not business. In art, the profit is in the process. When you go to the museum, don’t check paintings off on your ”life list,” but rather, spend an hour — a full hour — looking at just one painting. Come back another time to see a second painting. The museum’s not going anywhere. Here’s good practice: Stare at an apple for an hour. I dare you. An apple is simple, available and familiar. But have you ever looked at one? Put it down on the table in front of you when you are alone, and without any music or the TV on. Concentrate. Good. You are supposed to be bored. Boredom is your friend. It is life’s great teacher, perhaps its only real teacher. You have bottomed out with boredom. Keep staring. Your brain won’t let you remain bored for long. You will break through the boredom and will begin seeing things you hadn’t noticed: An apple isn’t red, for instance. It is purple, yellow, green, blue, white and red. The colors are not on the surface of the apple but at different depths. The red seems to lie on top of the yellow. And all colors are under the thin layer of shiny cuticle. The surface of the apple is a pool your eye can dive into. The colors tend to run in streaks from top to bottom. The streaks break up into spatters of tiny dots of color, like airbrushing. Hundreds of yellow dots cover the darker red like nighttime stars. In this case, the yellow seems to lie on top of the red. The apple isn’t smooth and shiny, but has a lot of tiny flat spots on it, and the dimples at top and bottom are matte rather than glossy — actually seem to be covered with dust. 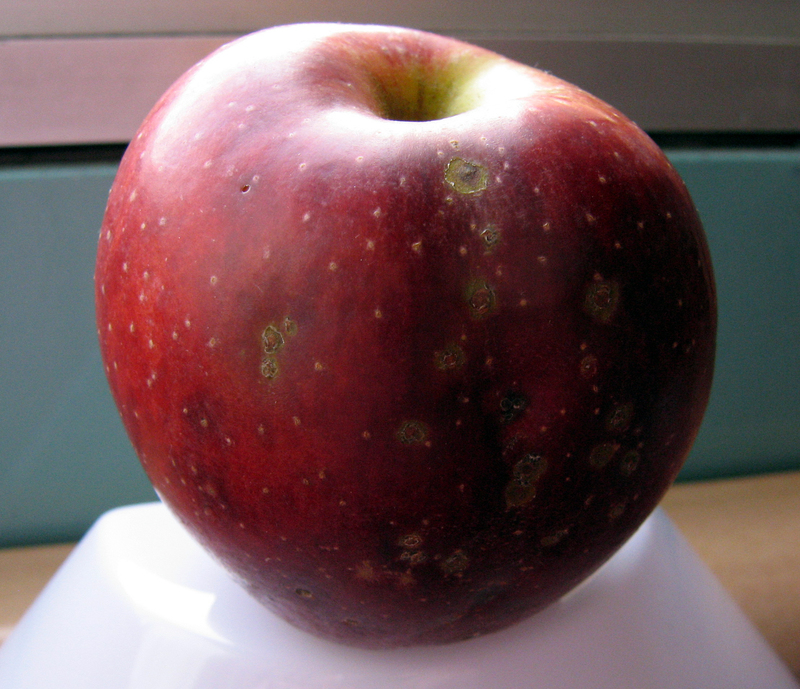 There is a navel at the bottom, amongst the four or five bumps that the apple sits on. It is filled with the remains of the sepals that originally protected the flower bud. If you tap the apple, it thumps with a particular pulpy resonance that only an apple can make. And there is that multilayered apple smell. This ”discovery” level is good for several minutes, as you get past the verbal level and pay attention to the apple. But you reach boredom again. Good. You’re supposed to — again. Keep staring. There are many more levels to reach. They needn’t follow the order I’m giving here. Everyone’s reactions will be different. But you have to trust your own boredom. Or you will create constellations from the star-dots. Or count the number of lights in the room by the number of specular reflections on the apple. You may start writing your own story about an apple. But eventually, boredom returns. There is surely nothing else to see. Keep at it. At one point the apple will disappear. Literally. The process of retinal fatigue will make the apple invisible. Twitch your eye just a hair, and the apple pops back into view. Stare and it fades, twitch and it pops back. This eventually becomes only a party trick and you are bored once more. At another level, you will recognize that the apple is only a freeze-frame in a continuous process. Looking backward, you see the sepals at the apple base turn back into a blossom, back into a bud. In the other direction, the fruit browns, rots and frees the seeds inside. Those seeds grow into sprouts, the sprouts to saplings, the saplings to trees. The trees flower, the flowers fruit, the fruit ripens and falls. Humans are born, they grow up, they have children, grow old and die, leaving the children to have children. You recognize that nature is not a noun, but a verb. An apple is not a Platonic “thing,” but a Heraclitan flux, always changing from one thing to another. Staring at the apple, you see the whole thing spread out like time-lapse photography. Near the end of this exercise, when all your normal conscious functions have bugged out, unable to take the boredom, the apple may begin to glow from inside. Every electron in every atom vibrates. This is the Blakean level, the mystical level. It is at this level that revelation occurs. If you can hold on to it, the entire world alters, not just the apple. This is the level of the art we as a culture most admire: Beethoven’s Ninth, Van Gogh’s sunflowers, Dante’s Paradiso, the second part of Goethe’s Faust. ”If the doors of perception were cleansed every thing would appear to man as it is, infinite,” wrote William Blake. It is the point you realize that every bush is the burning bush. Whether it is mystical revelation or merely hallucination hardly matters. It changes the way you see an apple. And is there a boredom beyond that — a mystic’s boredom? If there is, I suspect it is broken through also, and probably by the Zen state: The apple turns back into an apple. But a very different apple.